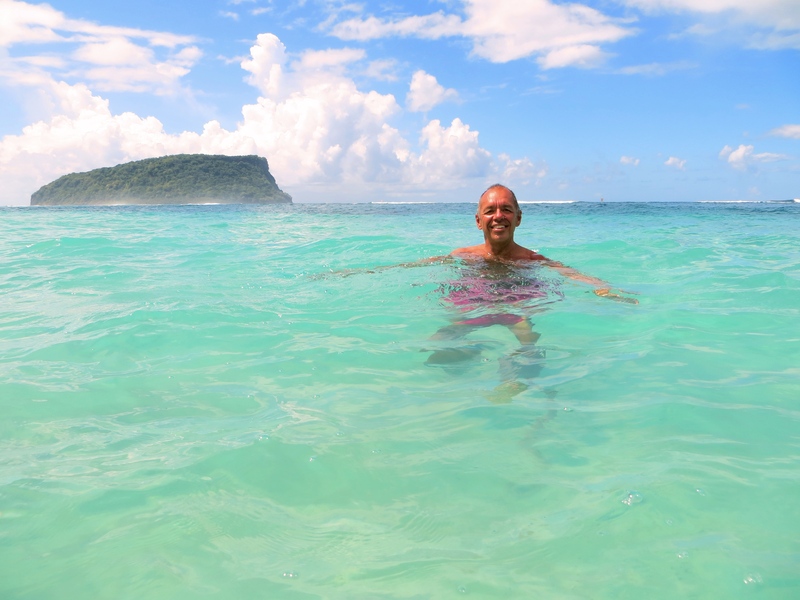 It’s time to say farewell to Samoa, but we really loved our two weeks here. Great beaches, beautiful landscapes, friendly people, good food – it’s an easy place to love. Our last four days was something of a whirlwind. 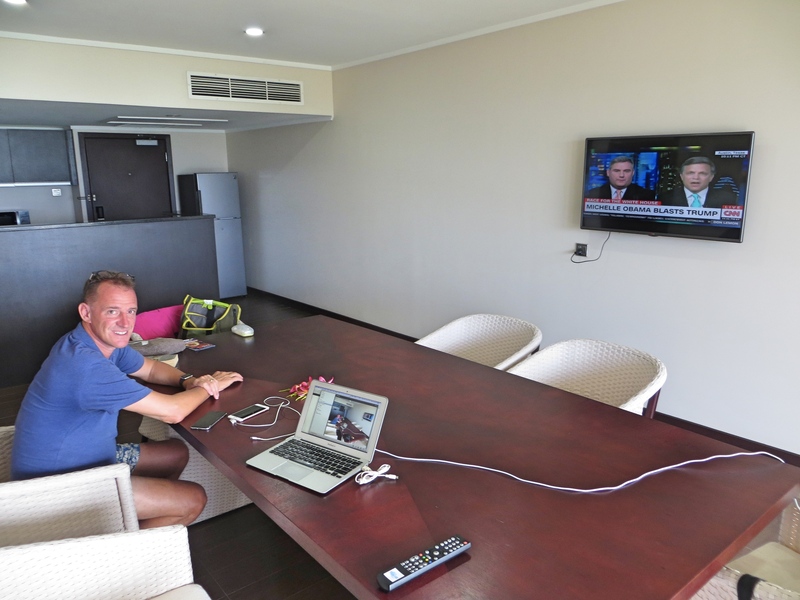 First we spent two days at a Sheraton resort right in Apia, a place where we were confident we’d have good cable to watch the Clinton-Trump presidential debate. I was a nervous wreck before the debate started but needless to say, we enjoyed the show. Surprisingly, we enjoyed the hotel, too, a place with a real history. Aggie Grey’s Hotel was the classic 1940s-era Samoan Hotel. 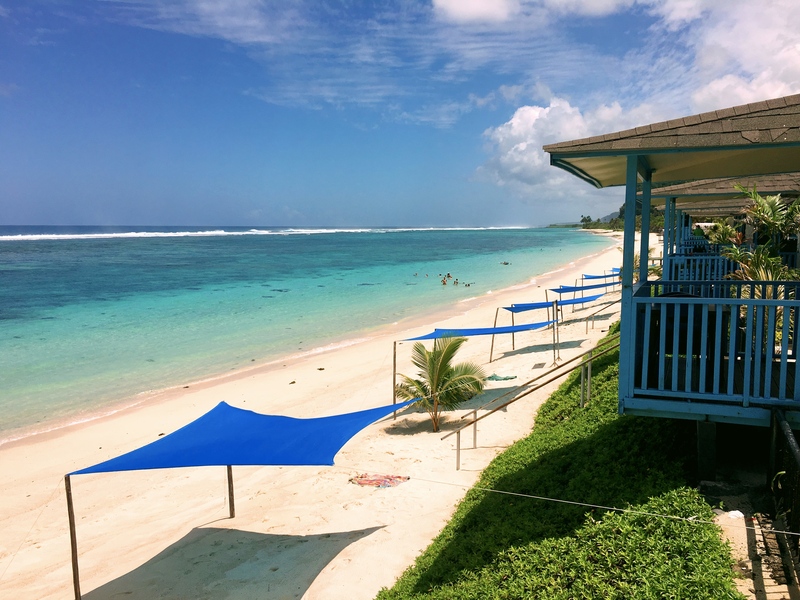 Named after the hotel’s founder, stars like Dorothy Lamour, Marlon Brando, and Raymond Burr had stayed there; she was a friend of James Michener and was likely the model for his Bloody Mary character in Tales of the South Pacific. Fast forward a few years and the hotel was starting to show its age until the Starwood chain bought the property, closed it down, and did a great renovation, updating it but keeping that ’40s-era feel. It only reopened last month and was a beautiful space to hang out for a couple of days. So he had to start over again. This time he bought property high above the coast, built a house for himself and his wife, and decided to build a couple of tree houses. It just goes to prove that even three-and-a-half years into this around-the-world adventure – and around and around and around – you can still find something utterly new. The cabins were amazing. 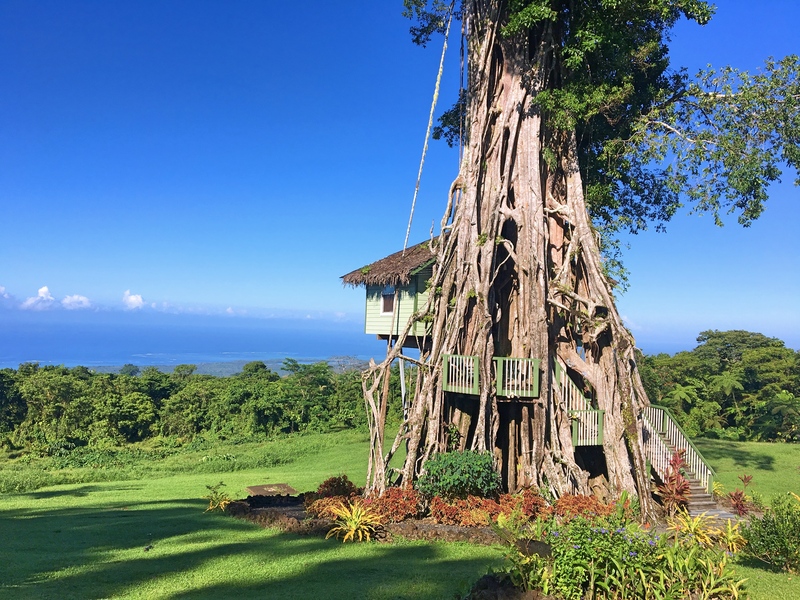 Built into a 300-year-old, 180-foot banyan tree, our cabin had a bedroom, small living room, bathroom, and deck overlooking the southern coast. 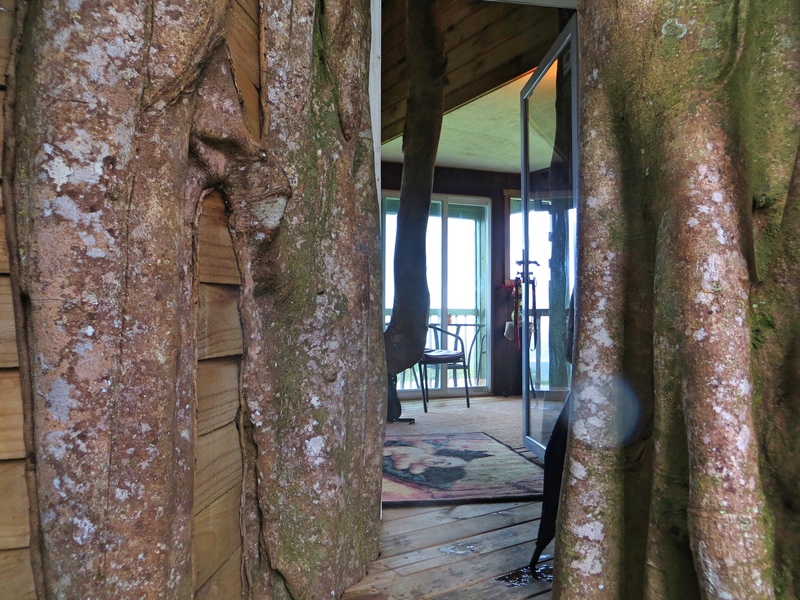 It’s worth saying that describing it as being built “into” the banyan tree is precisely true. The banyan, you see, is a fig tree that starts as vines growing on another tree. 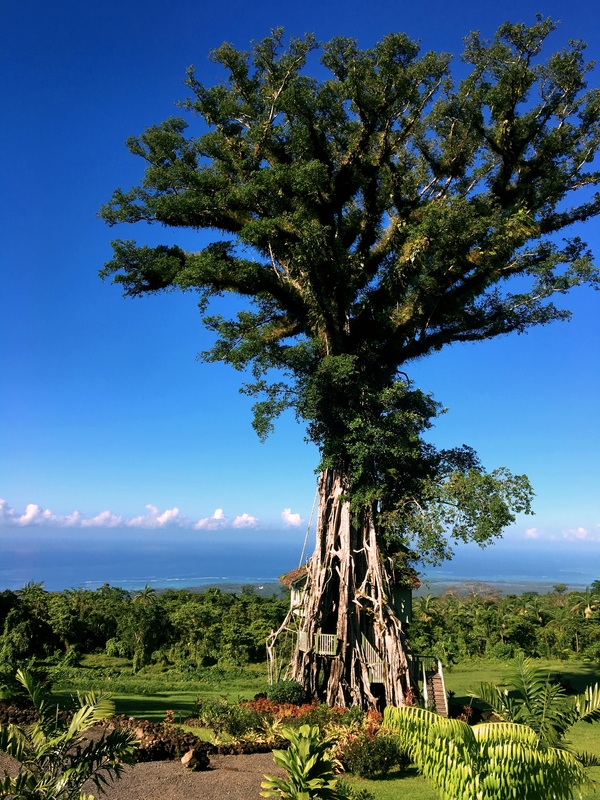 Over time it completely subsumes the host tree which eventually … disappears. Some of the cabin, thus, was literally inside the remains of that long-since-gone tree. Stunning, and an engineering marvel. 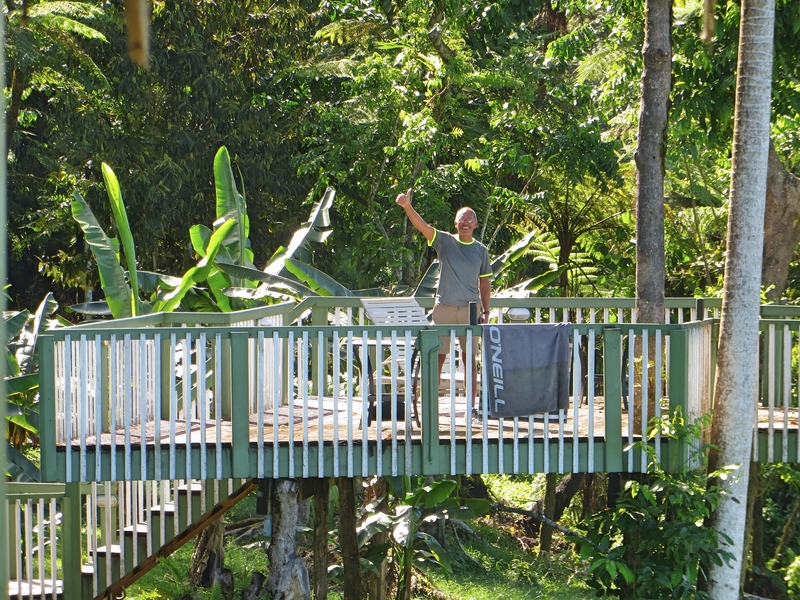 If you ever get to Samoa, you gotta spend at least one night up in the trees. Finally, we headed to the western end of the island for a last night at another Sheraton resort right near the airport for our morning flight to Fiji. We like staying in Starwood properties because, after spending enough nights there they typically upgrade us to a nice room, often a suite. This one was particularly notable. A big bedroom, big bathroom. Big living room with a separate bathroom. And a conference room. Conference room? Yup, I’m sitting at a conference table watching CNN typing this blog. There you are. Samoa: Great beaches, friendly people, hotel rooms in trees, and suites with conference rooms. Strange place. Next stop Fiji! 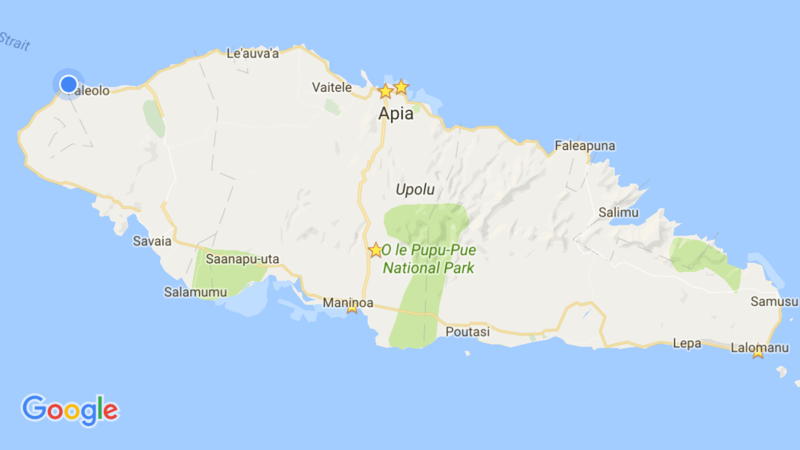 Here’s the island of ‘Upolu and the various places we stayed. As you can see, north, south, east, west, and center … we covered the island pretty well! 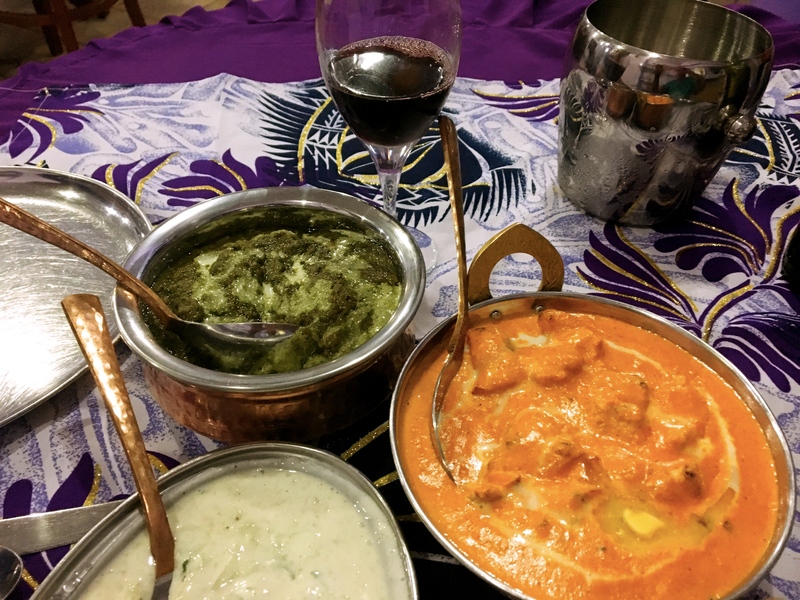 We found a great Indian restaurant in Apia. Great food, big portions, chilled red wine, all at half the price of any other decent restaurant in the city. And while we’re on the subject of food, our hosts at the Treesort had an amazing menu for such a small place. 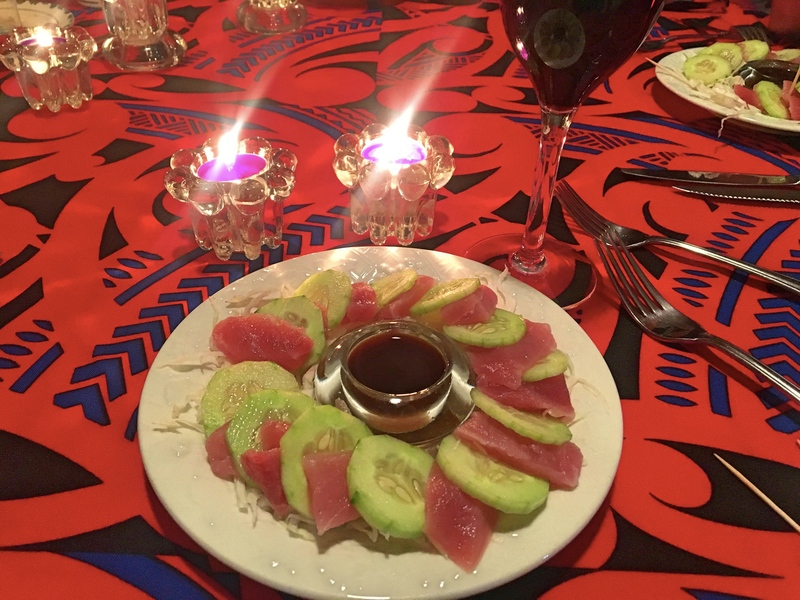 This was a nice sashimi plate with beautiful candles and great wine. Did I mention that you should stay at the Treesort some day? We get haircuts all over the world. 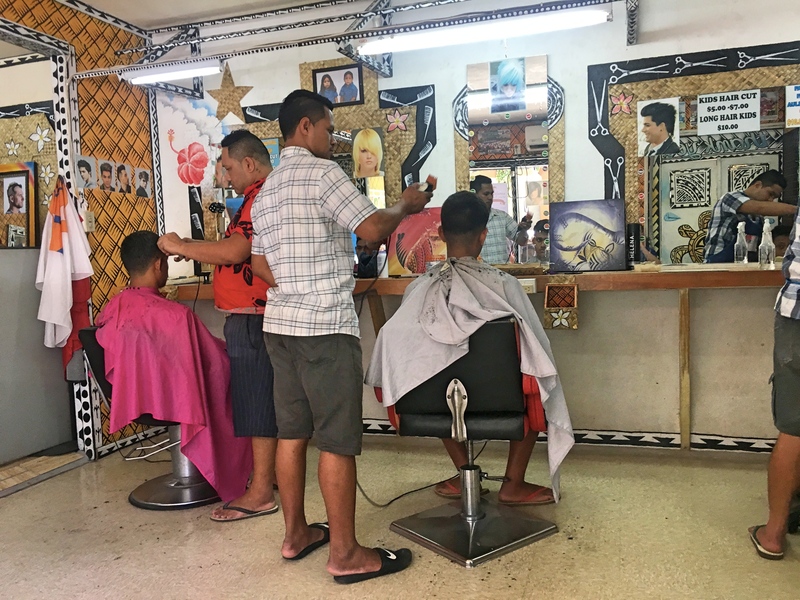 Here’s Apia’s barbershop where mark paid a grand total of about $2.60 for his current haircut. Just a short walk from our hotel was this small, local, healthy food lunch place that was really quite good. Mark’s having a most excellent Niçoise salad there with fresh tuna. Now we’re just kind of biding our time until the Presidential debate. 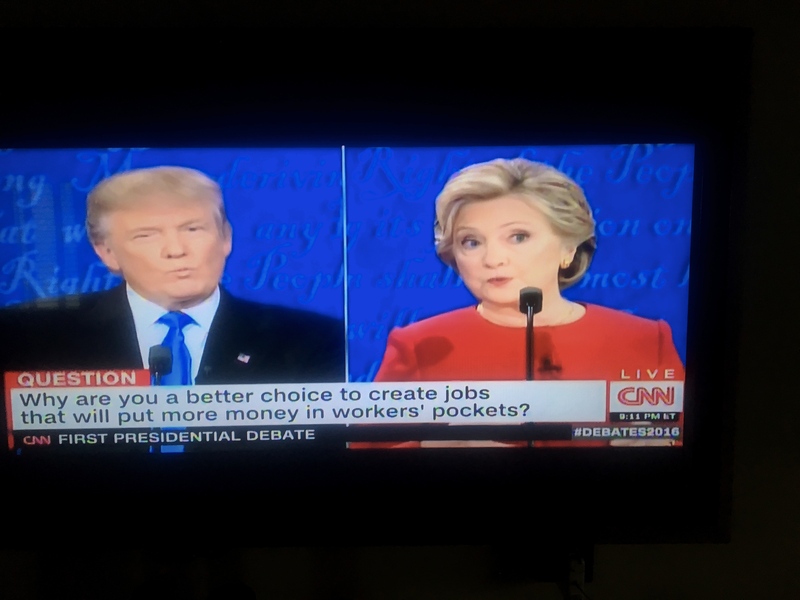 We had some choices after Lalomanu, but we really wanted to be certain we’d be in a place with good TV coverage so we could watch the debate on September 26 (though here in Samoa it’s on September 27, which makes it a little confusing to plan for). 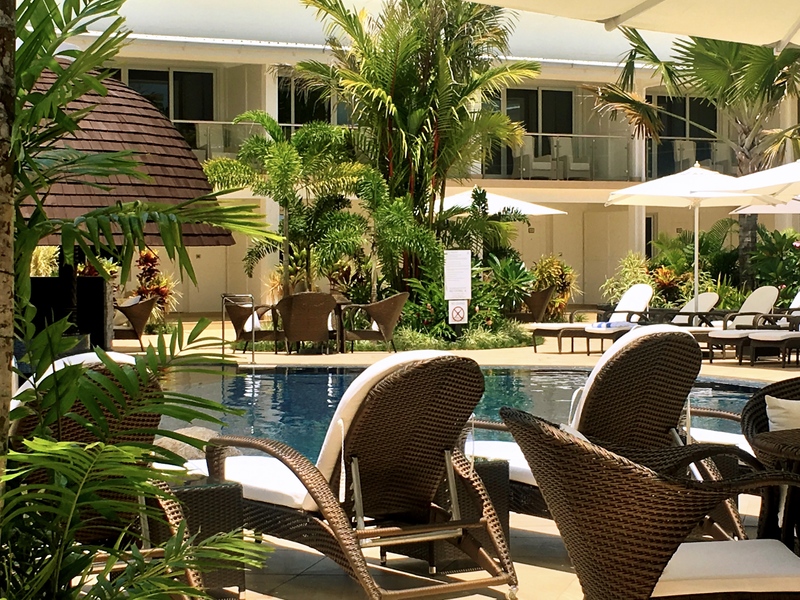 Since there’s a Sheraton in Apia, Samoa’s capital city, we figured we would stay nearby and check in there for the debate. In the meantime, we spent four days at a brand new resort on tiny Taumeasina Island just outside of the city. That was a mistake. The new resort is all shiny and comfy and the pools are nice, but it utterly lacks personality and has little of the tropical landscaping that makes the area so beautiful. We’re in Samoa, but it feels as though we could be at any resort anywhere. I know, this is not the worst problem anyone has ever faced (I’m reading a history of D-Day and the Battle for Normandy right now, and that would be worse) but there’s just not much going on in or around Apia for excitement. 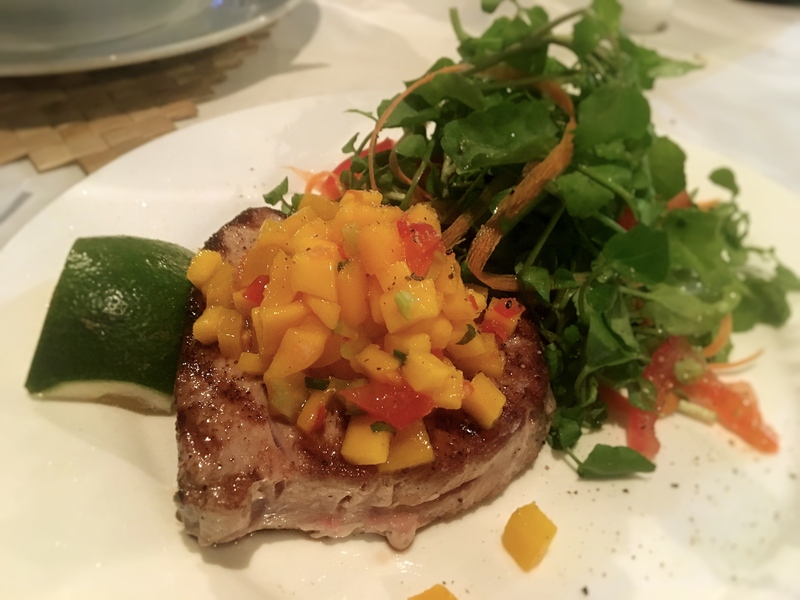 We have managed to find some good food – a nice Italian place where all the waiters seem to be gay and a great, local lunch place near our hotel. Otherwise this four-day stay was kind of a waste. The pools at Taumeasina Island Resort. You really can’t complain about a beautiful place like this, except, well, I did. The island group, including what is now American Samoa, was historically known as the Navigator Islands. If you’re reading a history of the age of exploration and are confused about where they are, that’s why. The country – technically the Independent State of Samoa – was known as Western Samoa until 1997, when it dropped the “Western” part of its short-form name. On September 7, 2009, the country changed driving laws to require driving on the left-hand side. Since so many cars on the island come from New Zealand, where they drive on the left, they figured they’d just bite the bullet and make the change. Apparently there were limited problems in the aftermath. Imagine, though, trying to make that change in the U.S. Yikes! Just three weeks after that change, though, there was a devastating tsunami that hit the southern coast of ‘Upolu. There was no December 30, 2011, in Samoa. Instead, on December 29 the country switched from the eastern side of the International Date Line to the western side and just skipped over December 30. The original positioning on the eastern side of the date line was made in the 19th century to facilitate trade with California, but these days most of the country’s economic relationships are with New Zealand and Australia. Nothing like throwing off those imperialist shackles! Strangely, Samoa appears to observe daylight savings time. We woke up on Sunday morning to discover that it was an hour later than we thought it should be. (As we’re a bit south of the equator, this is the start of spring in the temperate zones so they “spring forward.”) From our experience it’s unusual for a country in the tropics, where the sun rises at 6:00 AM and sets at 6:00 PM pretty much year-round, to switch to daylight savings time. It must be, though I’m just guessing, that they make the change here at the same time New Zealand changes so they remain always on a fixed clock vis a vis their primary economic partner. And the really bizarre part is that now we’re 25 hours ahead of American Samoa. So when it’s 12:30 AM on September 26 here, it’s 11:30 PM on September 24 there, seemingly two full days away! That’s all the excitement from Samoa. Waiting for the debate, then a couple more days on the island, including one night in a tree house. 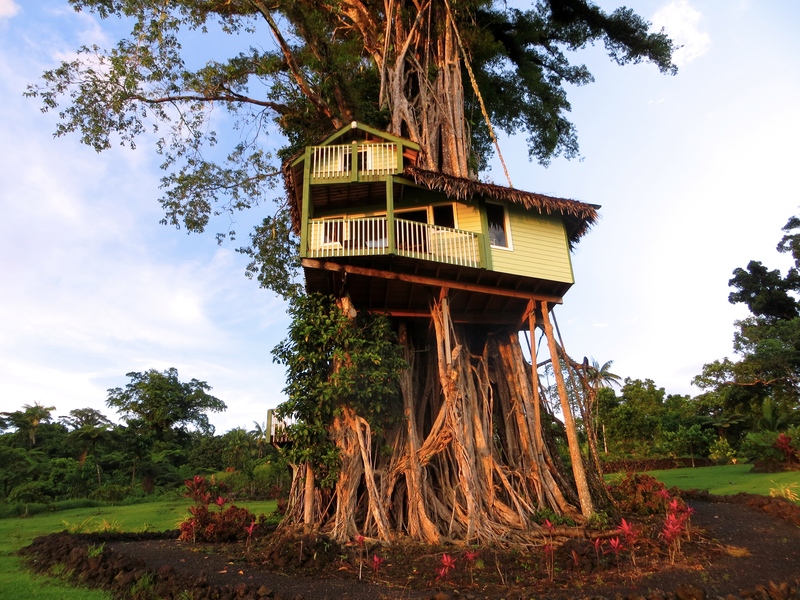 Yup, a tree house. 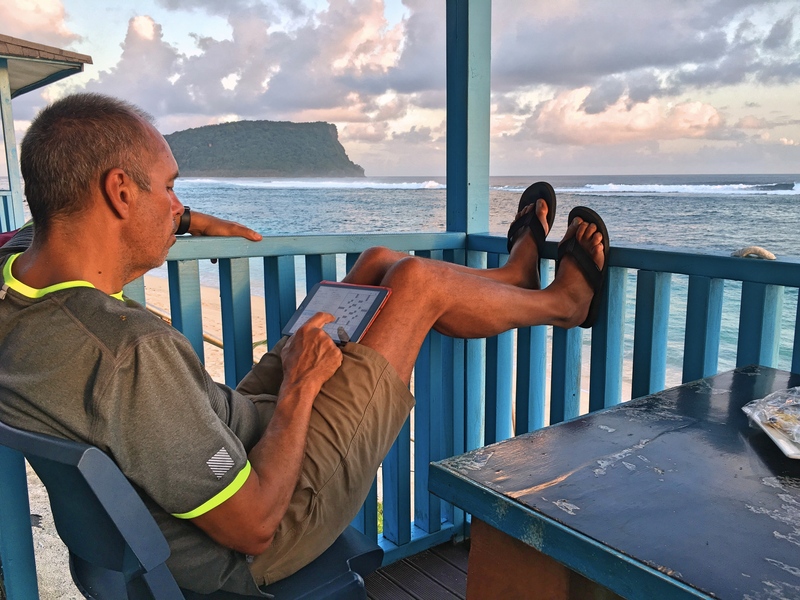 We’ve had lots of time here to sketch out the rest of our time in the South Pacific and for now, at least, it looks as though from here we’re going to Fiji, Tonga and then New Caledonia. After all these years of not getting to the South Pacific we’re finally making up for lost time. The weather out here is fascinating. It can go from sunny to stormy and back again in a matter of only a few minutes. 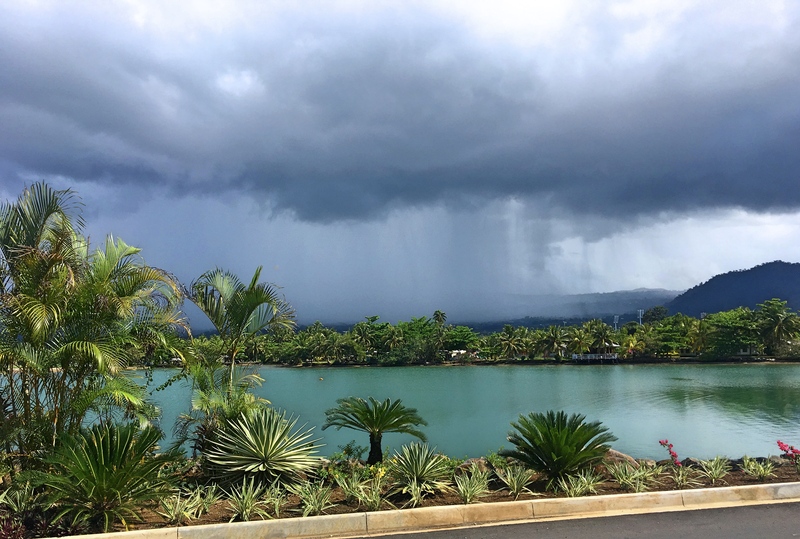 This is from right outside our hotel as we planned on walking into Apia. 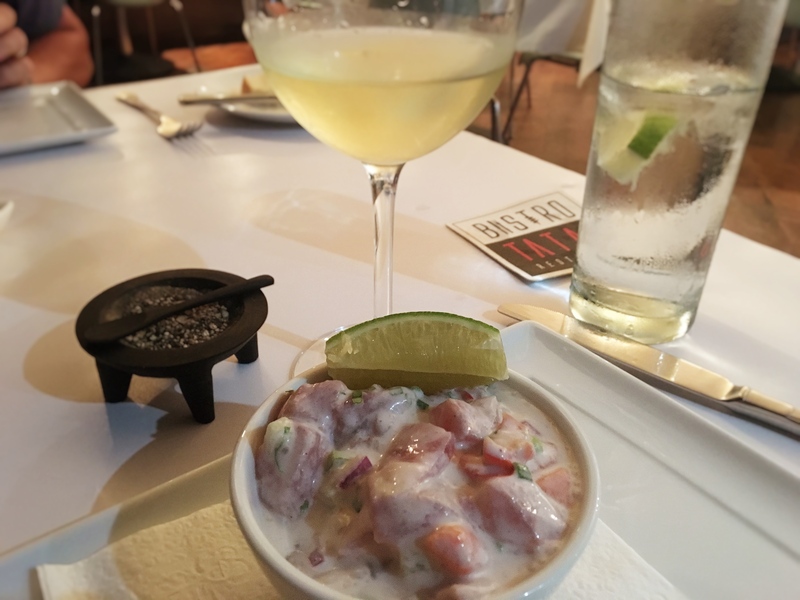 Oka is a classic Samoan dish similar to ceviche but made with coconut milk. It can range from good to really, really good, but is always better with a glass of crisp New Zealand wine. Not a bad place to spend some time, eh? 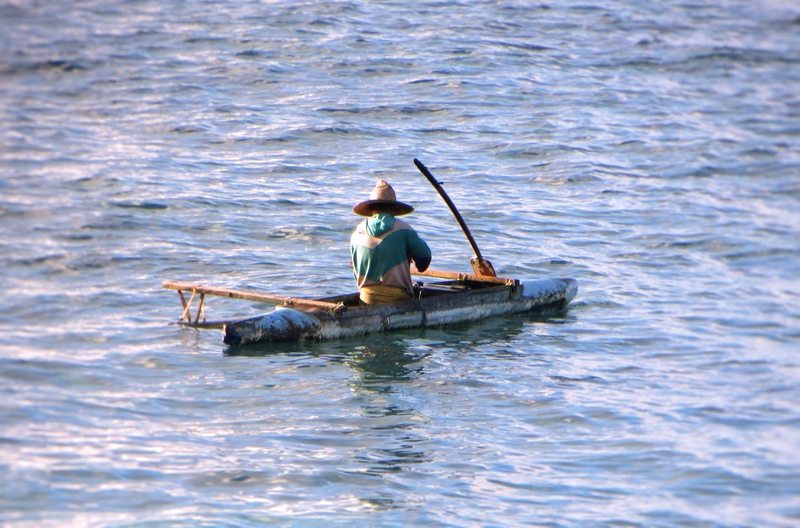 We’re going to spend a couple weeks in Samoa to explore ‘Upolu, the most populated of the country’s islands. This stop is something of an experiment, considerably more rustic than the standard we’ve come to enjoy. 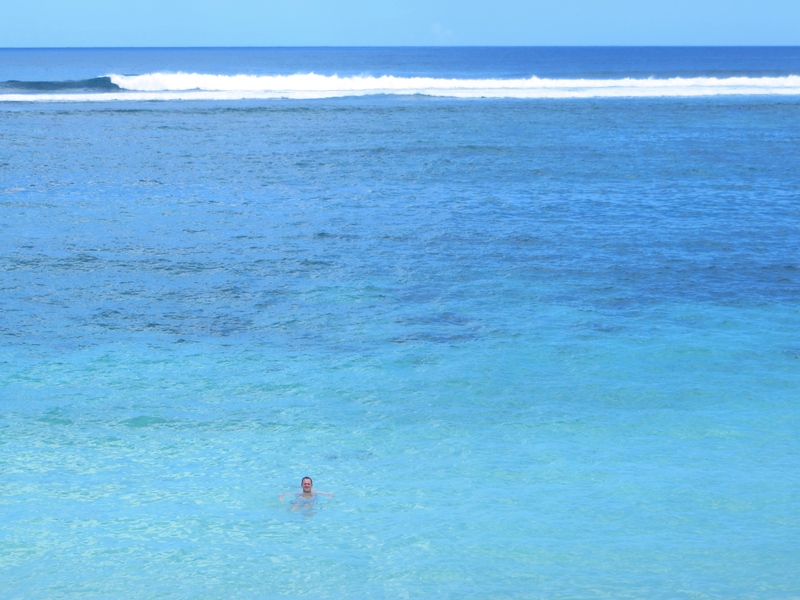 Lalomanu is on the far eastern tip of ‘Upolu and supposedly has the most beautiful beach in Samoa. 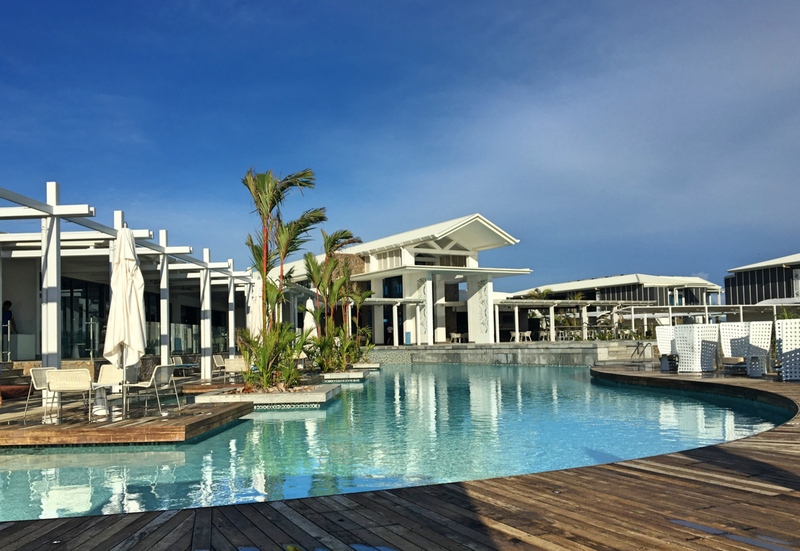 Much of the area was devastated by a tsunami in 2009 – there were pictures of the aftermath in our little resort and there was really nothing left standing – but the area has recovered remarkably. At the same time, the “resorts” are pretty basic. Litia Sini Beach Fales, where we stayed, is a step up from most, as the beach huts – known as fales (fah-lay) – have doors with locks and actual beds instead of just mattresses on the floor. Electricity, even! Still, it’s pretty basic, as in “shared bathroom” basic. As I said, not our usual standard. 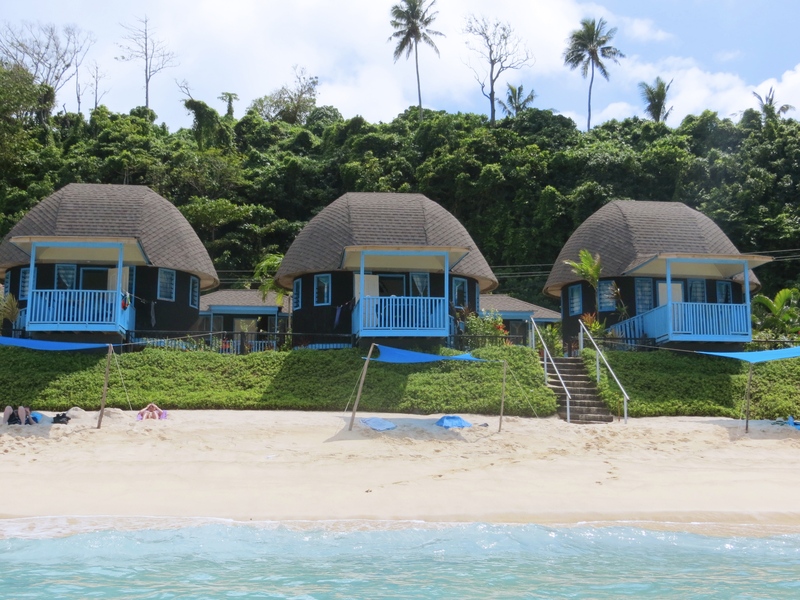 That’s our fale in the middle, little baseball-cap-like huts with limited facilities. But you couldn’t get closer to the beach and the porch there was a perfect spot for a night cap. Still, with a couple exceptions, we loved it. The beach really was spectacular. There were no beach loungers, but they had blue tarps strung up that somewhat shielded you from the sun so you could spend long, leisurely days doing pretty much nothing. (The young New Zealander in the neighboring fale discovered to his sun-burned dismay that the tarp doesn’t fully protect you from the sun’s UV rays, though.) And the shared bathroom wasn’t a problem. Meals were on the not-quite side of OK, but we weren’t too keen on the limited, set hours for meals. The biggest downsides were unbelievably aggressive, small mosquitoes that just ate me alive and the heat at night with no AC made it really difficult to sleep at night, even with all the windows open. The highlight, though, was clearly the beach. White sand, blue water. Doing nothing. The little porch on our fale was pretty great for a little scotch at night (we’d come prepared). 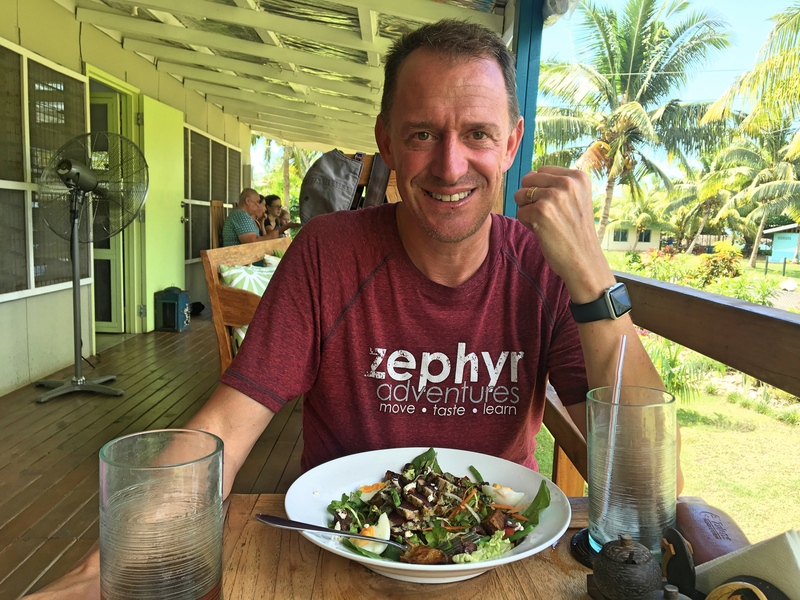 We spent time over meals with a fun German couple who love to travel but otherwise it was a few days of sun, sand, and not much else. 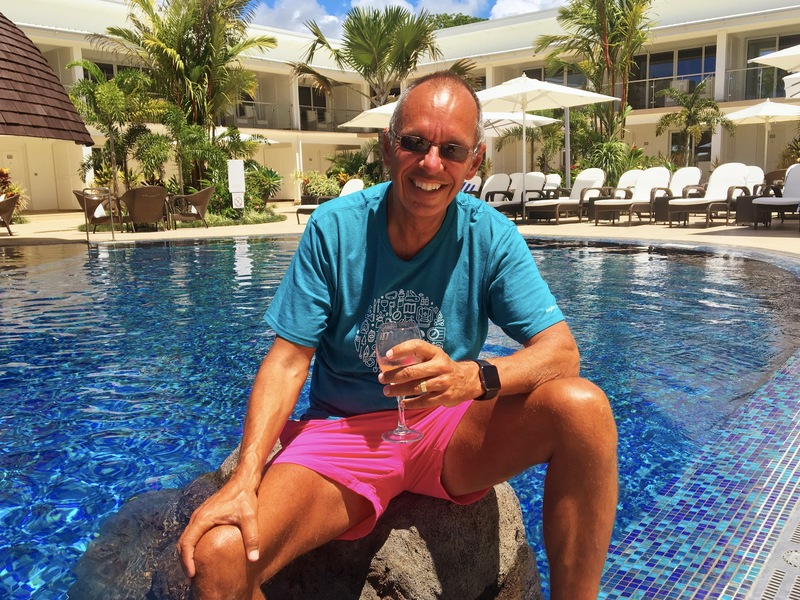 Mark enjoying what Lalomanu has to offer. You can see that the waves break far from shore making the area like a great big warm lake. Up the beach from our fale.